This paper presents the exact and complete fundamental singular solutions for the boundary value problem of a n-layered elastic solid of either transverse isotropy or isotropy subject to body force vector at the interior of the solid. The layer number n is an arbitrary non negative integer.The mathematical theory of linear elasticity is one of the most classical field theories in mechanics and physics. It was developed and established by many well-known scientists and mathematicians over 200 years from 1638 to 1838. For more than 150 years from 1838 to present, one of the remaining key tasks in classical elasticity has been the mathematical derivation and formulation ofexact solutions for various boundary value problems of interesting in science and engineering. However, exact solutions and/or fundamental singular solutions in closed form are still very limited in literature. The boundary-value problems of classical elasticity in n-layered and graded solids are also one of the classical problems challenging many researchers. Since 1984, the author has analytically and rigorously examined the solutions of such classical problems using the classical mathematical tools such as Fourier integral transforms. Inparticular, he has derived the exact and complete fundamental singular solutions for elasticity of either isotropic or transversely isotropic layered solids subject to concentrated loadings. The solutions in n-layered or graded solids can be calculated with any controlled accuracy in association with classical numerical integration techniques. Findings of this solution formulation are further used in the companion paper for mathematical verification of the solutions and further applications for exact and complete solutions of other problems in elasticity, elastodynamics, poroelasticty and thermoelasticity. The mathematical formulations and solutions have been named by other researchers as Yue's approach, Yue's treatment, Yue's method and Yue's solution. 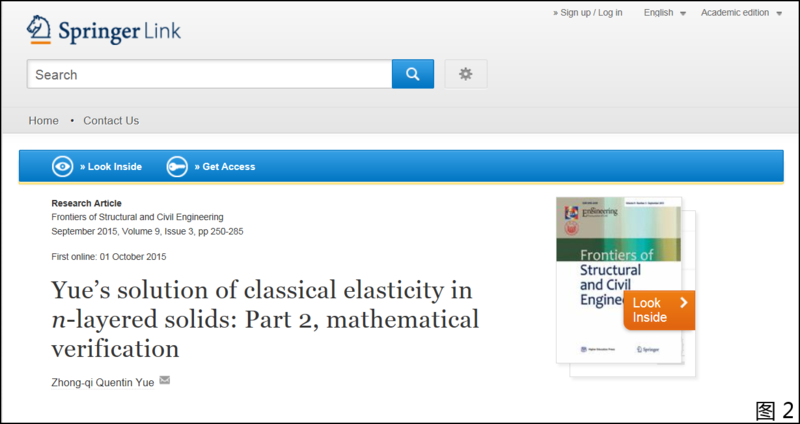 This paper presents a detailed and rigorous mathematical verification of Yue's approach, Yue's treatment, Yue's method and Yue's solution in the companion paper for the classical theory of elasticity in n-layered solid. It involves three levels of the mathematical verifications.The first level is to show that Yue's solution can be automatically and uniformly degenerated into these classical solutions in closed-form such as Kelvin's, Boussinesq's, Mindlin's and bimaterial's solutions when the material properties and boundary conditions are the same. This mathematical verification also gives and serves a clear and concrete understanding on the mathematical properties and singularities of Yue's solution in n-layered solids. The second level is to analytically and rigorously show the convergence and singularity ofthe solution and the satisfaction of the solution to the governing partial differential equations, the interface conditions, the external boundary conditions and the body force loading conditions. This verification also provides the easy and executable means and results for the solutions in n-layered or graded solids to be calculated with any controlled accuracy in association with classical numerical integration techniques. The third level is to demonstrate the applicability and suitability of Yue's approach, Yue's treatment, Yue's method and Yue's solution to uniformly and systematically derive and formulate exact and complete solutions for other boundary-value problems, mixed-boundary value problems, and initial-boundary value problems in layered solids in the frameworks of classical elasticity, boundary element methods, elastodynamics, Biot's theory of poroelasticity and thermoelasticity. All of such applications are substantiated by peer reviewed journal publications made by the author and his collaborators over the past 30 years.